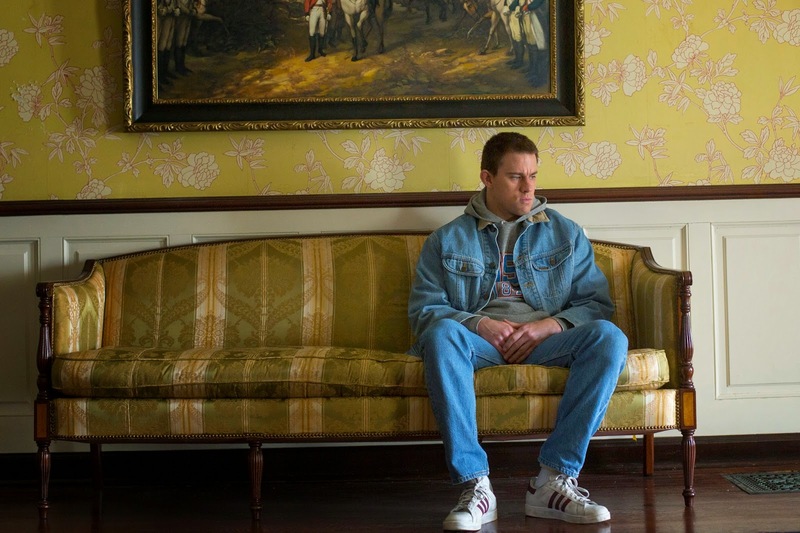 It is difficult to fathom exactly what is going on in director Bennett Miller's Foxcatcher. The characters here are hesitant to let you into their worlds let alone their heads. As an audience member, we feel as if we're watching from the outside in on the situation at hand, never knowing the motivation of anyone as each seem to live in this world of fear. Whether it be John du Pont (Steve Carell), Mark Schultz (Channing Tatum) or even Dave Schultz (Mark Ruffalo) each possess a fear of either coming to terms with logic and the abnormalities of their situation or the fear of losing control. While the Schultz brothers are vastly different from one another they both come to understand the oddities of their circumstances at Du Pont's Foxcatcher farms. Du Pont, on the other hand, is little more than a mystery to everyone around him. Mark comes to the heir of the Du Pont family fortune early and allows the stranger things about his mentor to slip through the cracks because he shows a belief in him that no one else has ever extended. Still, despite the relationships that evolve and the dynamics that come to the surface never do we feel as if we can see why these characters are the way they are. Every line of dialogue though is used to peel back a layer of the characters and reveal something more about the backstory that has made this person who they are today. It is a technique that Miller uses most effectively allowing us to constantly crave more from the film while only giving away what it wants you to know so as to not poison the ambition of the project with unsatisfying conclusions. Whether you know what is coming or not you are riveted by the procedural nature of the film as it methodically chronicles the rise and fall of a friendship never believed to be genuine and the repercussions of the falling out of that paid for affection. Foxcatcher is a strange film filled with strange people, but it is all the more fascinating for it. It is a film I feel I could go on writing about for days and discussing at even greater length as I know each time I re-visit it I will only find new things that only highlight what I might have barely took note of before. It is a cold film, one that will at first seem off-putting for it, but the more you think about it the more the inhumanity produced by the circumstances it chronicles eats away at you. 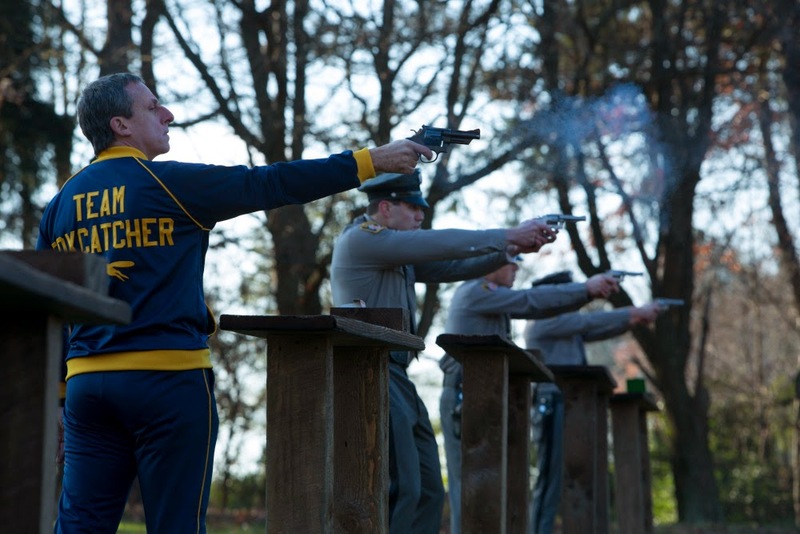 John du Pont (Steve Carell) practices his aim at Foxcatcher farms. 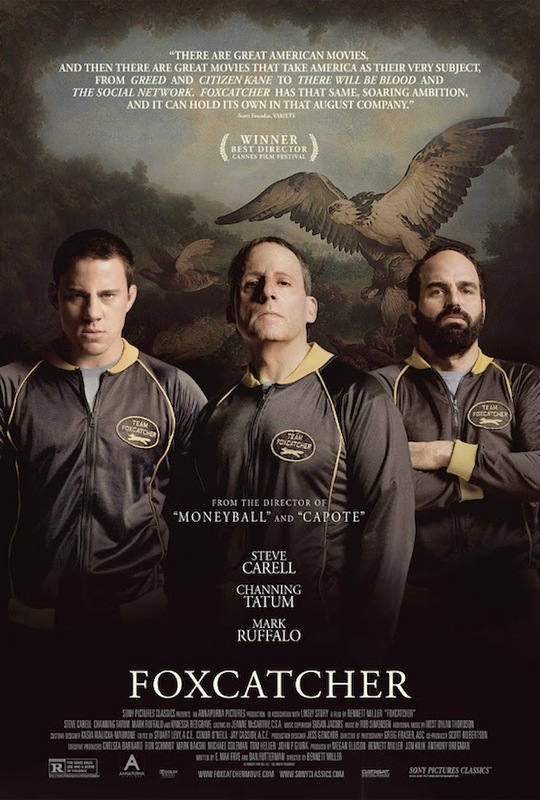 Based on a true story, Foxcatcher essentially tells of the relationship between an eccentric multi-millionaire and two champion wrestlers. Mark Schultz was a 1984 Olympic Gold Medal winning wrestler who, after going to great lengths to win for his country, had come to be little more than disregarded. He went from being recognized on a worldwide stage to making speeches for sixth graders and eating Ramen Noodles in his small apartment. Mark is defeated while only craving more and hoping to make a return to the games in 1988. His fortune seems to change for the better when he is invited by the wealthy Du Pont to move on to his estate and help form a team to train for the Seoul Olympics. Du Pont knows little of the craft of wrestling, but with his money and new state-of-the-art training facility he is accustomed to getting what he wants. Schultz jumps at the chance seeing it as the opportunity to finally be free of the shadow of his more revered brother, Dave. Du Pont, on the other hand, sees backing Schultz as his own opportunity to "coach" a world-class wrestling team. Du Pont has a clear goal in mind as he seeks to not only build a world champion wrestling team, but more a larger collection of achievements that he can stick in his mothers trophy room so as to possibly win her approval. In order to do this, in order to accomplish what he himself is unable to do he must buy those who can do it for him and trick them into believing he is as royal and dignified as he believes he is. Thus, the initial attraction to the timid Mark offers a head he can play with and possibly still bring around his brother. It is when Du Pont's unpredictable personality becomes fixated on Dave, the most level-headed person in the film, that Mark goes into a downward spiral and Du Pont begins to lose control. It is Du Pont's need to feel included, to feel necessary or to feel some type of connection that he can't seem to grab onto. After Dave reinvigorates Mark to fight in the games and with Du Pont having already placed Mark on the backburner it is here the eccentric millionaire grows more fearful of not copacetically achieving his goals giving way to the real tragedy of the story. "I think there are a few psychological issues we need to take care of," John du Pont mutters at one point in the film. This feels like a massive understatement given the amount of head games being played here. It also brings us to what is most impressive about Miller's film in that he successfully conveys every element of who is playing what angle while never fully letting us into the minds of the characters. We can evaluate these people, sure, but we don't know them which is all well and good because we don't necessarily want to. In prying these guarded, but exploitative performances from his actors Miller is able to keep a consistently intense, but quiet tone about his film where everything is boiling right under the surface. As Du Pont, Carell is something of a revelation. We've never seen the actor in such a form before either physically or mentally. Du Pont is certainly the most guarded character here having never been allowed to let anyone in due to the fact he could trust no one growing up as he did and was only undermined further by the truths he came to learn of as an adult. Everything in his life he's had to buy with his excessive wealth and he's grown accustomed to positioning those he needs something from in a head space of them needing him in return. We understand Du Pont's reasoning, but we never get a full picture of what is driving the man. Sure, he wants to feel respected by not only his mother (Vanessa Redgrave), but his peers and yet that doesn't seem enough to justify this fear and incompetence inherent to his state of mind. Mark is very much the same in this regard of having low self-esteem. As Mark, Tatum plays the wrestler as something of a muted monkey with what we at first perceive as a heart of gold. As things progress and Mark is given his moment to shine he becomes more vulnerable and overly dependent on the approval of his new mentor when he should in fact be gaining confidence. Confidence is what Dave has that neither John nor Mark can seem to muster in the effortless way Dave exudes it. It is through the amalgamation of these three men and their wants and needs from one another that the drama is born. Mark Schultz is forced into an unhealthy lifestyle by his benefactor and mentor. I firmly believe you could drop me in at any point in this film and whether it be the shot selection, the performance, the understated music and tone or simply the themes and ideas at play that there would be something substantial to talk about. Miller was said to have labored over the film for a much longer period of time than any filmmaker should probably be allowed and it shows. Miller has also discussed how his first edit of the film was four hours and fifteen minutes which presents the only weakness of the film. The necessities are here, everything from how Mark Schultz gets from A to Z, but it is also clear Miller isn't one who likes to paint a picture where he hits his points directly on the nose. He likes to allude to them, hint at them and leave openings for his audience to take it as they wish. He is a director of subtleties and in this final cut (which runs only two hours and ten minutes) it almost feels he's been forced to cut out the cushioning of what adds to the more direct scenes that have been left as the complete film. The editing here is made to be of a disciplined nature so as to reflect the mentalities of the brothers at the heart of the story, but it is in certain spots that we feel there is more to tell, more to reveal which in turn creates the guarded facade of the film. This doesn't necessarily make the version that's been released any less effective, but in seeing what Miller has been able to present in this form it certainly adds intrigue as to what his full vision was for this harrowing and grandly somber tale. It is not in the description of a critic to discuss what could have been though and so, still, in taking what Miller has given us with Foxcatcher I cannot help but remain in awe of every aspect. From the elaborate production design that has been draped in dull and gloomy color tones to the ominous, but hard edged soundtrack by Rob Simonsen that is sparingly used there is something about the film you can't quite pinpoint but continue to be fascinated by long after the credits roll. Du Pont becomes fueled by paranoia and fears the alienation he spent millions to avoid forcing him to do the unspeakable and that Miller captures his own paranoia and constriction in every scene of his film makes for as gripping an experience as any other I've had at the movies this year.